Keith Lamont Scott, a 43-year-old black, disabled man, was shot and killed by police in Charlotte, North Carolina, on Tuesday, Sept. 20. What exactly happened to Scott is still under investigation. However, his family alleges that he was reading a book when he was killed. Officers alleged he posed a threat and was armed. Scott's death is a tragedy that we have seen far too many times and has sparked outrage and grief. 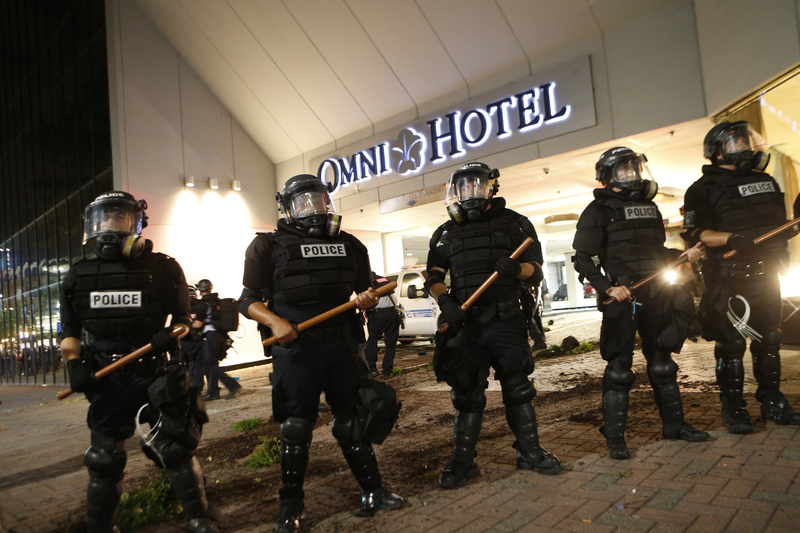 Protests erupted across Charlotte erupted on Tuesday and Wednesday night. Here's a look at 10 chilling photos from the Charlotte protests. Scott's death followed the police killings of Tyre King, a 13-year-old boy from Columbus, Ohio, on Sept. 14 and Terence Crutcher, a 40-year-old father of four from Tulsa, Oklahoma, on Sept. 16. With each of these tragic deaths, I can only imagine the trauma and the pain that follows, as violent encounters with police occur far too often in America. It is increasingly important for white Americans to listen to the voices of African Americans, and to demand action and change. After word of Scott's death in Charlotte, many people took to the streets to protest. One protester told NPR of Wednesday night's events: "Police began firing tear gas to move the crowd back from the hotel entrance. And protesters tossed fireworks back." On Wednesday night, one person was shot during the protests and is currently on life support. The shooting was reportedly "civilian on civilian," ABC News reported. However, after the last two nights of protests, Charlotte Mayor Jennifer Roberts has reportedly said she would consider imposing a curfew on Thursday night. "We did sign a statement last night to declare a state of emergency, which gives us that authority," she said in an interview with Good Morning America.